Houston, TX – Redemption. The No Kill Revolution in America, by Nathan Winograd, is a book that has arguably caused the biggest transformation in the way hundreds of pounds and shelters in America operate. This book has changed the minds of thousands of people who read it and realized that there was a better way of sheltering versus what was taking place in most pounds and kill shelters. They realized that there was hope. And this book has saved many thousands of shelter pets because of the people who are now educated regarding how to end shelter killing in their own communities. 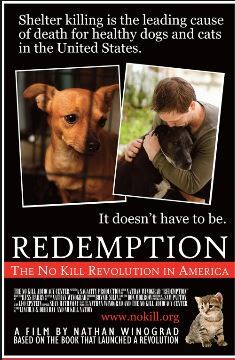 When I read Redemption, it completely changed my way of thinking about the pet sheltering industry. I realized that so many things that the kill shelters and national “humane” organization have told us were completely wrong. I read Redemption on a flight to and from Minnesota and I spent most of the flight with my mouth hanging open in utter shock and amazement…. * shocked at the hypocrisy of the national, multi-million dollar, animal “welfare” organizations that have been fighting against the life saving programs of the No Kill model of sheltering. Since I read Redemption, I have encouraged every person, who cares about animals, to read it. As president of No Kill Houston, I have given away more copies than I can count because I believe that the information contained in Redemption is critically important to ending shelter killing in all communities. I am happy to say that there is now a film based on this ground breaking book and I am happier to say that it will be shown in Houston! Just like the book, this movie is a must see for anyone who cares about animals or who cares about creating a more compassionate society. Redemption will be shown in Houston on October 7, 2014. Doors open at 5:30 pm and the film will be shown from 6:00 pm to 7:00 pm. Nathan Winograd will do a presentation, from 7:00 to 8:00 following the film, on how you can help build a No Kill community. Admittance to the film and presentation are FREE, but you MUST register first. **From Nathan Winograd: This film is an earnest and honest portrayal of sheltering in the U.S. and offers proven solutions. Because it deals with the truth about shelters in the U.S., it is by necessity, sad and difficult at times, but never gratuitously so. And because it deals with the solution, people will come out of the theater feeling very, very inspired. More than anything else, the film is an uplifting story of redemption.